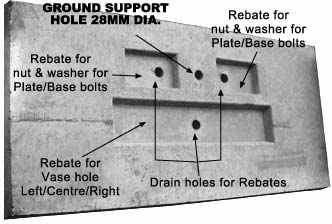 Once the foundation is in place, drive the support rod through the preset hole in the foundation, leaving only 1″ (25mm) exposed beyond the washer. 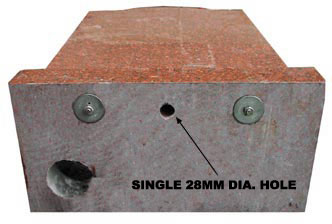 Position the memorial over the support on 2 x 3″ high skids, to allow hand clearance underneath. Lift the support by inserting a pinch bar under the washer and raising it. Spin the washer back down and repeat. 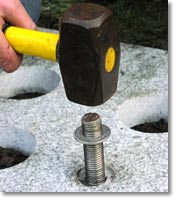 Using this procedure you can locate the base support hole, align the memorial over it, and continue raising the support as before until the rod meets the memorial plate. 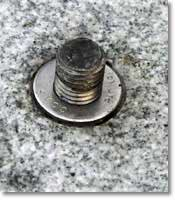 Spin the washer up so that it meets the bottom of the memorial base, this ensures the correct positioning of the anchor components relative to the base thickness. Cement the base to the foundation and remove skids to fix.